You are here: Home / APPETIZERS / Football Party! Baked Chicken Wings! 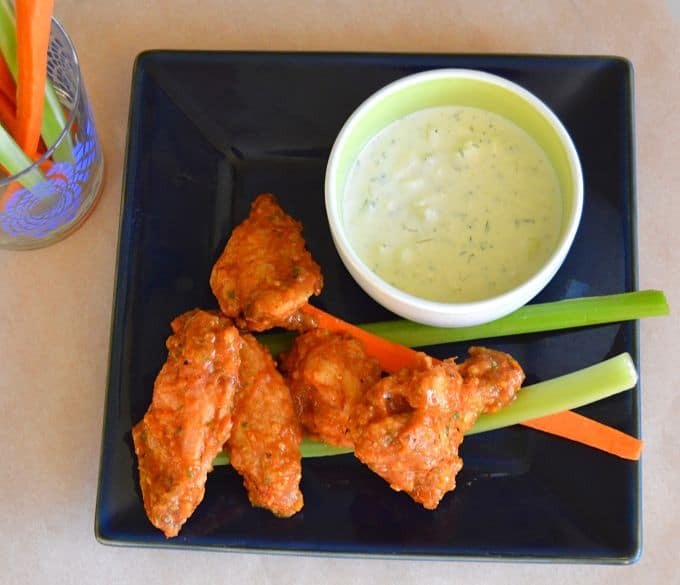 Baked Chicken Wings are a healthy option that don’t skimp on flavor or the crunch you are looking for for a game day snack! It’s the end of summer, which in my world means ….. Hello College Football!! This week my favorite team The Nebraska Cornhuskers kick off their season so it’s reason to serve baked chicken wings as an appetizer while having a few people over to watch the game. Later this week we’ll make a great cocktail to go with them! 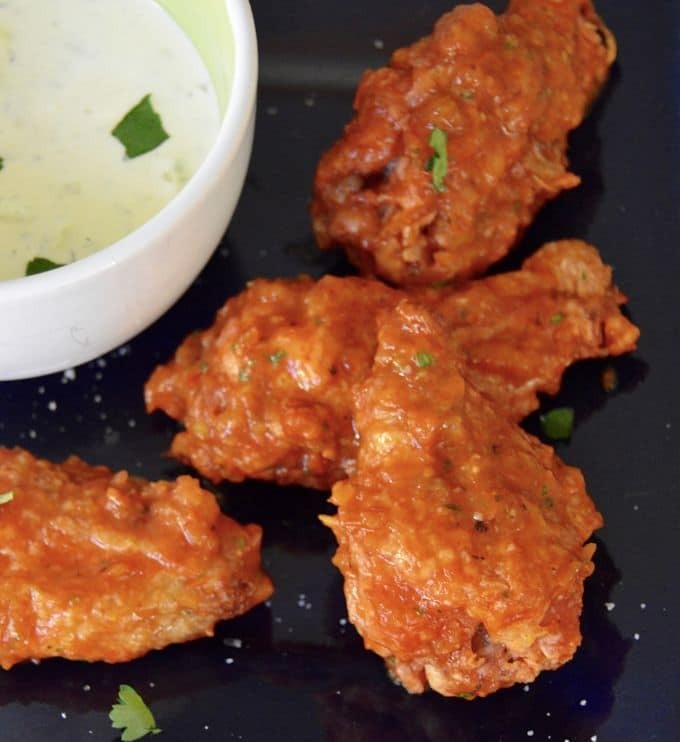 You don’t have to love football to like these wings; they are a great appetizer for cocktails or can even be a nice dinner! One of my favorite magazines is Cook’s Illustrated. I love that it is super technical for the how’s and why’s of science and exactly what causes things happen. When I was looking up recipes for baked chicken wings almost every place I read about them credited Cook’s Illustrated for how to make these. They cannot be any easier. You make sure to completely let them dry out to avoid sogginess, then you toss them in a little salt and baking powder and finally bake them at a couple of different temperatures and wow! 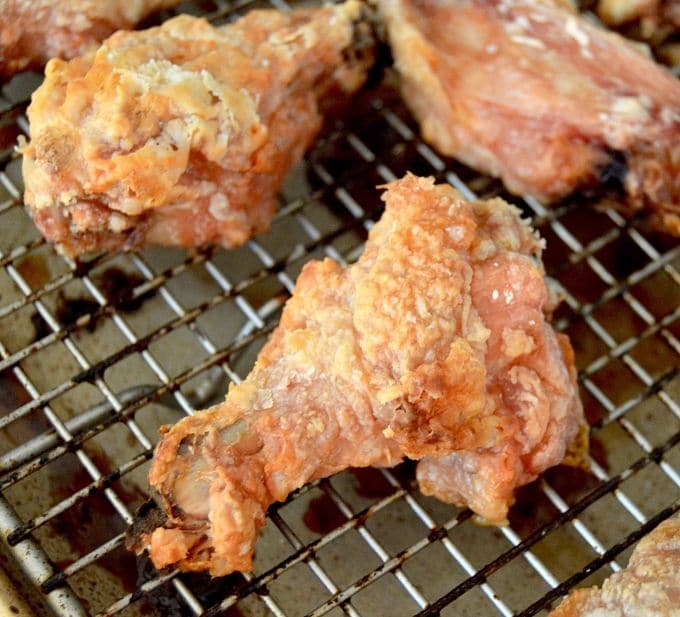 Crispy, not greasy, delicious chicken wings. In full disclosure I must tell you to not make the mistake I made on one of the first batches. It’s baking POWDER, not baking SODA. I know there is a difference, but somehow had bought baking soda at Trader Joe’s and their packaging is exactly like the traditional baking powder and just didn’t read the label as I mindlessly grabbed the ingredient. Needless to say, I will not make that mistake again!! 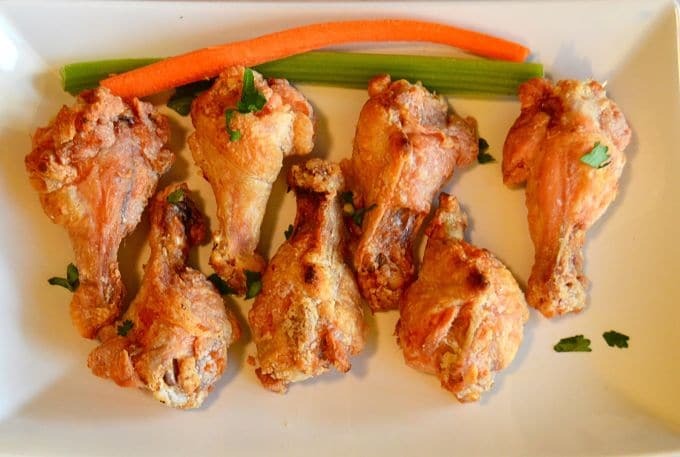 Look at how crispy and not greasy these are after baking, before you toss them in your favorite sauce…..
Crispy Perfection ~~ Baked Chicken Wings! I wanted to make wings because they are always a crowd pleaser. The wings are crispy and quite tasty on their own, but tossed with a sauce they are delicious too. Of course the wings tossed in Franks red Hot Sauce are always a favorite, but I like to serve a couple of different varieties! I have the Hatch Chili Salsa that I made back in August with the Hatch Chili peppers and this is a perfect addition to the baked wings. They still have the crispiness when you bite into them, but the hatch chili salsa gives it that Zing you want in a wing!! 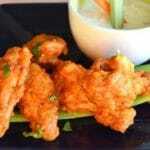 CRUNCHY AND DELICIOUS BAKED WINGS!! Simple to make, a sure fire crowd pleaser, these baked wings are just the answer for your football viewing party. They are healthier than the fried version, but still crispy, crunchy and delicious when served plain or toss them in my Hatch Chili salsa (or use your own sauce)... the more options the better at a party!! Lay wings out on a paper towel lined plate and place in the fridge to dry for 1-2 hours. If you don't have time, be sure and blot all wetness before cooking. Place baking powder and salt in a ziplock bag and mix thoroughly. Then add dried/patted wings and shake to coat evenly. Spray a wire rack that will fit inside your baking sheet with a nonstick cooking spray. Before placing wire rack onto baking sheet, line baking sheet with foil for easier cleanup. Then place sprayed wire rack into baking sheet. Place coated chicken pieces on wire rack. Don't worry about them being too close together, they shrink when cooking. Bake at 275° for 30 minutes on a rack on the lower third of the oven. Move chicken to top rack in the oven and cook for 40-50 minutes until golden brown. Rotate the pan every 15 or so minutes. Remove chicken from oven and allow to rest for 10 minutes. If serving without a sauce plate up and season with salt and pepper to your taste. If serving with a sauce, place sauce (in this case, Hatch Chili Sauce) in the bottom of a bowl. Then add several pieces of chicken, stir to coat evenly. Then remove them to a serving plate and repeat until all chicken coated. Can be served up with a dipping sauce such as a blue cheese or ranch dressing. You can buy chicken wings precut to drummettes, or they are very easily cut on your own, usually a little cheaper. You cut the tip off of the wing end, and cut at the joint where the wing meets the little drummette. Try it, its really quite easy. « Hatch Chili Season!! Cue the Roasted Salsa! soo crispy! They look so good! Baked chicken wings are the BEST and yours look shatteringly crisp and flavourful – which proves you don’t need to deep fry these babies! This is my kind of food. I am also a huge fan of Cooks and can’t get enough of their baked chicken wings. Your hatch chili salsa sounds so good… I can’t wait to give it a try. Love the tips about baking the wings. I’ve never done that before, but sounds like the perfect method to make them perfectly crisp and yours look amazing.. so does the chili sauce! Thank you! The crispiness is sure a hit in our house!! 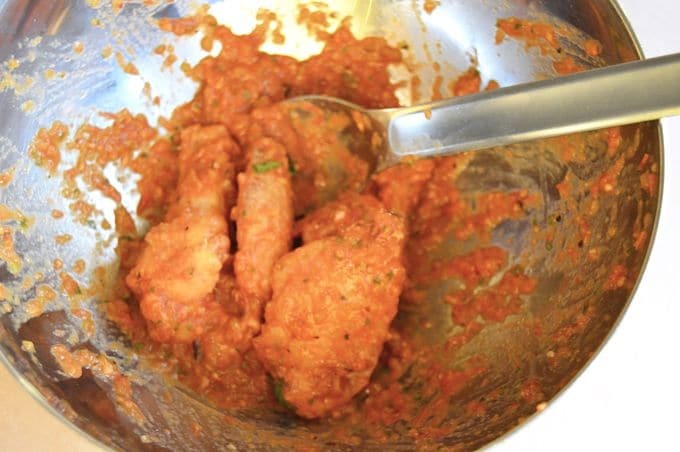 The hatch salsa is great, but it any of your favorite flavors for wings will work too! I know… the baking powder is the “miracle ingredient to make it happen! I love Cooks as well 🙂 You had me at hatch chili salsa…I am in love with those chiles after fire roasting them a few weeks ago. Can’t wait to give these crispy wings a try. Once you’ve had hatch chilis its hard to not LOVE them!